Congratulations to our 5 finalists Frugl, Purple Realtime, Firef.ly, DigiRail and CommuterHive for making it this far. We are beginning the second of 8 exciting weeks and I, for one, cannot wait to see the end product. 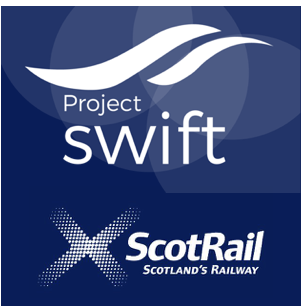 The Project SWIFT Open Innovation Challenge is part of the Innovate UK & RSSB supported project to enable super-fast Wi-Fi on trains to enhance passenger experience in rail travel. The finalists have submitted and pitched ideas of applications which will work hand-in-hand with 1TO1 Link’s APIs to disrupt our traditional views of train travel. The 8-week incubation period will allow the SMEs to develop their ideas while receiving mentoring and access to Project SWIFT partners: RSSB, Cisco, Level 3 Communications, CGI, Wittos & Intersection Analytics. At the end of the 8 weeks, the finalists have the opportunity to pitch their final app to interested parties. The stakes are high and the clock is ticking.. So, let’s meet the finalists! Frugl is your one-stop-shop for daily deals, bargains, events and discounted activities across the UK. For those who have not yet come across this term, ‘frugl’ is a transitive verb representing the search for information about something inexpensive to do or buy on the Internet using the website 'Frugl'. Example usage in a sentence: How did you find this great deal? I frugl’d it! Purple Realtime are realtime web app development specialists who excel in making web apps to enable users and clients to collaboratively work together. Purple are bringing their interactive web app skills to rail with a gamefication service that assists and rewards passengers on their journey. Firef.ly is your intelligent pocket travel companion that helps plan, journal and re-live all of life’s journeys. Apart from tried-and-tested guides for key major cities, the app makes capturing your memories effortless and presents them beautifully for moments when you want to reminisce. No more spending hours looking for a memory in 5 different apps. Firef.ly keeps all your memories in one elegant app. Commuterhive brings together commuters travelling to the same destination to offer them a shared taxi ride. Their machine learning technology identifies real time surges in demand and groups commuters based on common destinations. Commuterhive has the potential to revolutionise how we get to events like concerts or festivals, making the experience simple, less stressful and saving us money too! EnMaas partnership with the RailAlliance is an adaptable ‘whole-system’ solution that connects all disciplines and distributes data to areas of the business where is can be exploited, to improve business performance collectively and in each area of the business. DigiRail has built several apps for the rail industry and will be tackling disruption management by helping mobility travellers onboard and alight more efficiently.